I read this article and found it very interesting, thought it might be something for you. 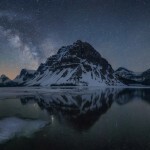 The article is called Canadian Rockies Photo Tour: Banff, Yoho and Jasper National Parks and is located at https://capturetheatlas.com/canadian-rockies-photo-tour/. 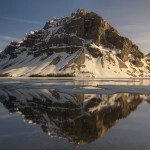 A Canadian Rockies photo tour is one of the most complete experiences for any nature photographer. You will enjoy the wildlife, landscapes, twilight lights, night photography and with a bit of luck until aurora borealis. All this in one place, where the new world is still virgin and unexplored. We took a photo trip to the Canadian Rockies for 15 days from the end of May to the beginning of June 2017 and without a doubt, this has been the most incredible trip we have made to date. In this photo tour, we got some of the best shots of our gallery. 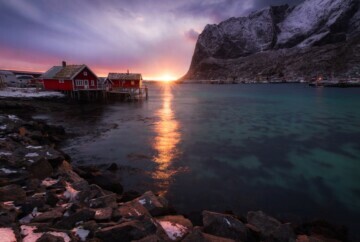 However, only by being able to spend 15 days in contact with pure nature, would have already made it worthwhile. That is why we would like to return someday accompanied by others photographers. 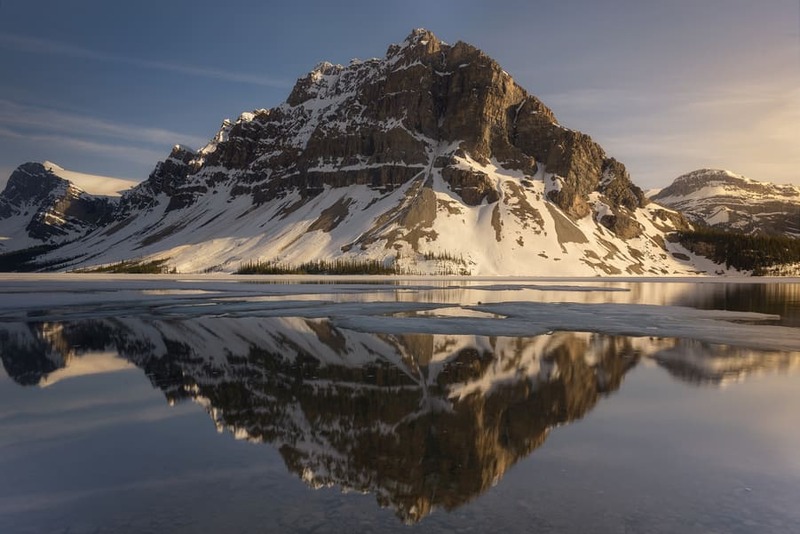 In this article, we will tell you our next guided Canadian Rockies photo tour itinerary, in case you want to join us, and we give you some tips if you decide to do it on your own. 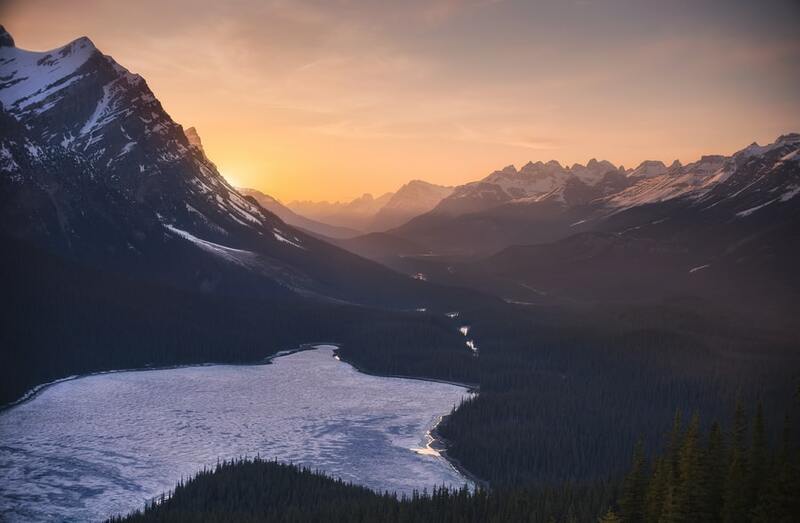 The Canadian Rocky Mountain Park is comprised of four National parks: Banff National Park, Kootenay National Park, Yoho National Park, and Jasper National Park. 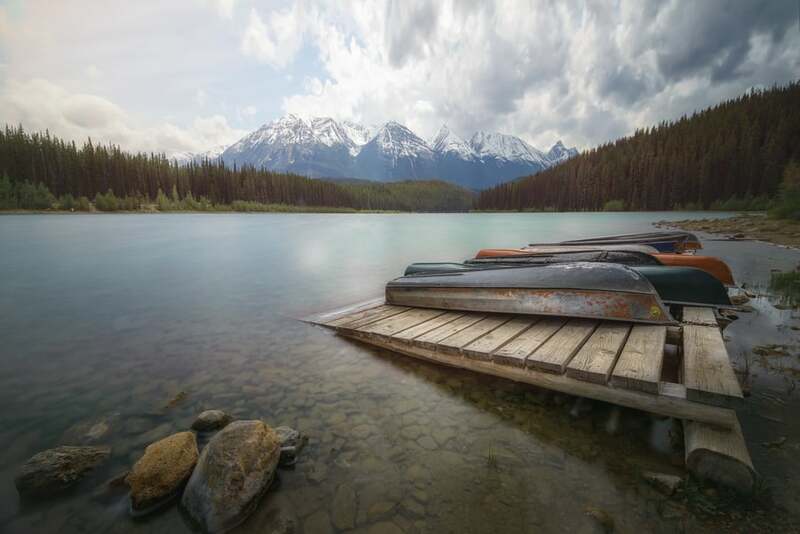 These parks are located in British Columbia (Kootenay and Yoho) and Alberta (Banff and Jasper). 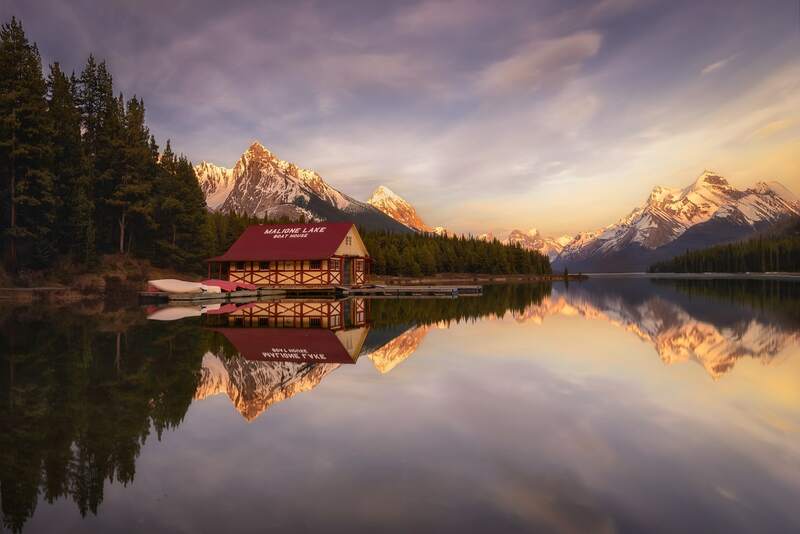 When making a photographic trip to the West Coast of Canada, the common thing is to visit Banff, Yoho, and Jasper, since these are the most photogenic places in the Canadian Rockies. 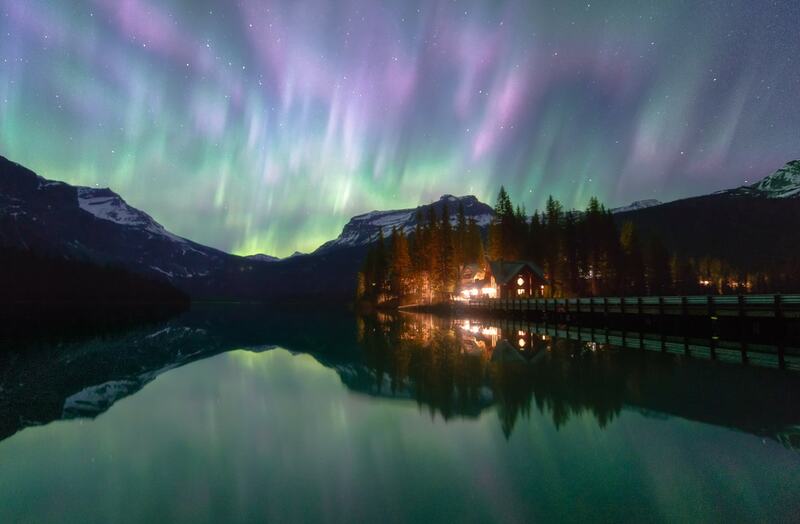 Although it is not the best destination for it, it can also be used to take a photo trip to see the Northern Lights in Canada. However, you have to bear in mind that the conditions that must be given are not the usual ones. Even without Aurora Borealis, do not worry. The best rocky landscapes, vibrant wildlife and the darkest skies of North America are waiting for you. 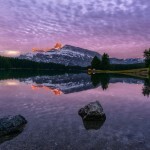 A Canadian Rockies photo tour is blow-minding for any nature photographer. 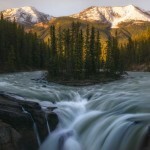 Without any doubt, I would say that the best time to attend to a Canadian Rockies workshop is from May to October. Let’s go for points. 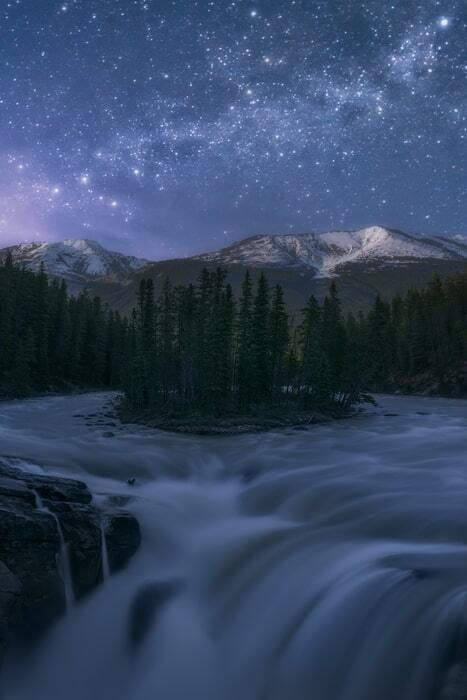 The weather in the Rocky Mountains is quite cold in winter, freezing all the lakes and cutting off most of the roads. In mid-May and depending on the year, the thaw begins and in mid-October, they will close roads and the lakes get frozen again. 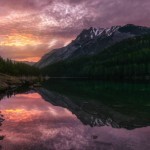 On the other hand, if you are interested in making cheap photography trips, you should bear in mind that June and especially July and August, are high season. The prices of the accommodations soar, but what is worse, you will have to keep tourists away so that they do not appear in the photos. 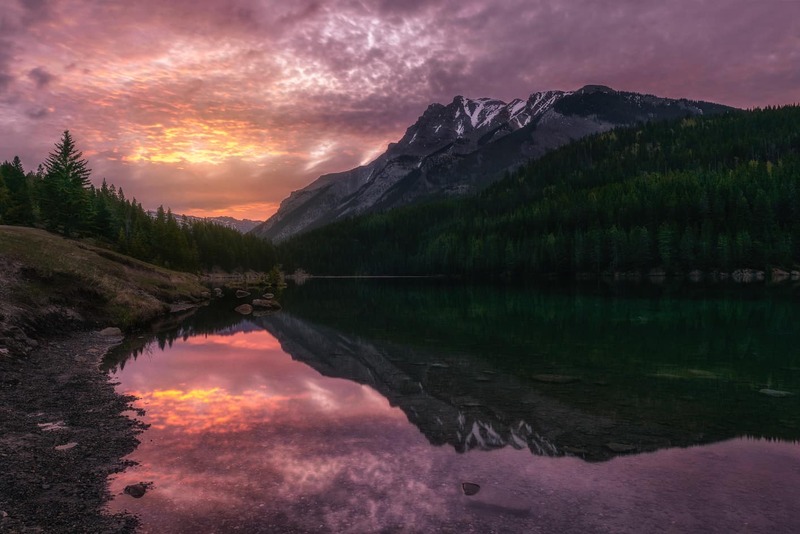 Finally, you also have to take into account that the numerous glacial lakes that we find in the Canadian Rockies present the most vivid color of which they stand out at the beginning of summer and this will go off as the months run. 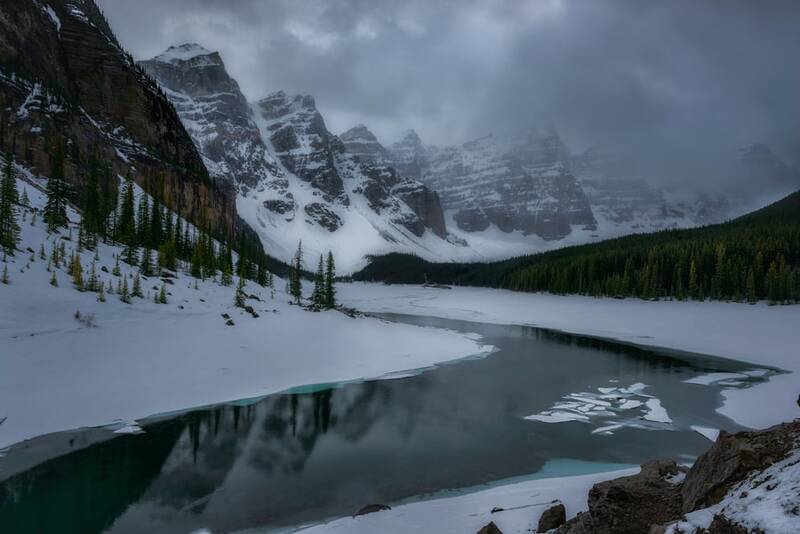 We traveled at the end of May – beginning of June and although there were frozen lakes and we missed some places of interest because of having still cut access, it seemed like a good time to travel to the Canadian Rockies. However, if you want to be able to see everything the Rocky Mountains offer you, at a good price, and with the minimum amount of tourists, I would recommend that you travel in September. 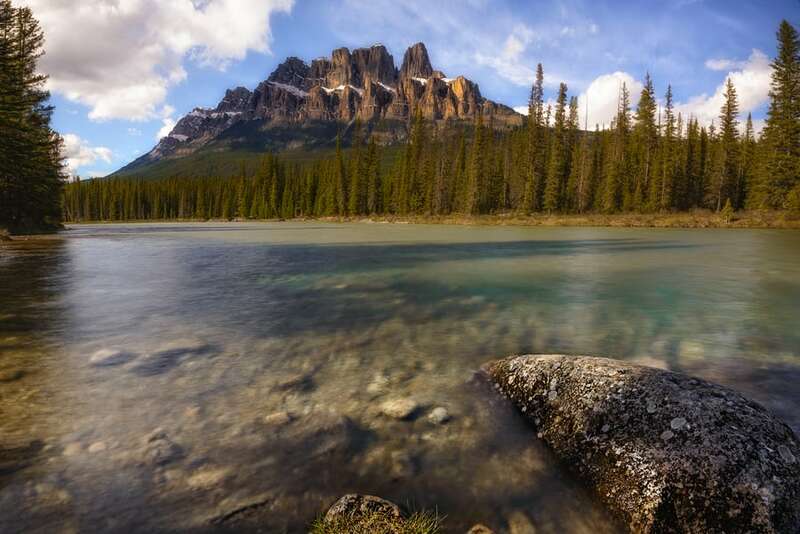 In this section, we will propose a route to take in a 15-day Canadian Rockies photo trip. Our photography tour will begin in Calgary. First of all, we must pick up our rental car and buy what is necessary for our photo trip. 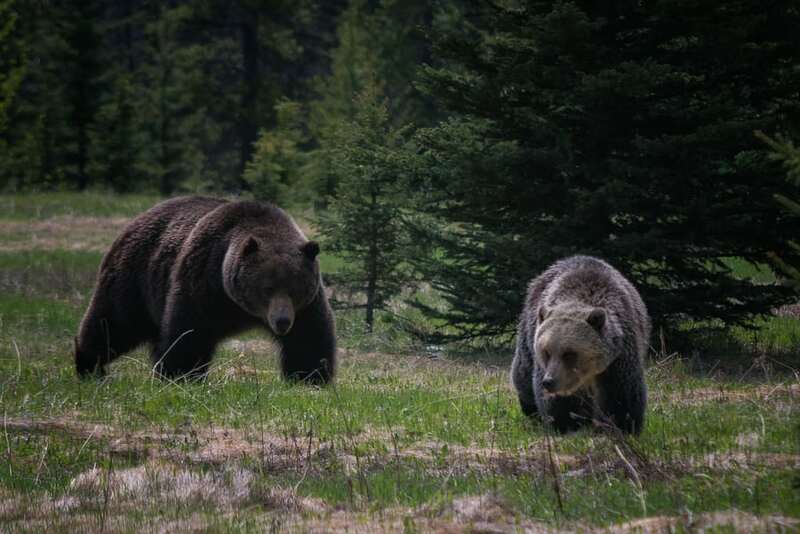 It will be essential to get a bear spray and other specialized equipment for this destination. Review that you do not lack anything from the list we did here. If we want to make cheap photography tours, surely we have to camp, so check that you have everything you need. Once we have everything ready, we will drive to Banff where we will make our first night. 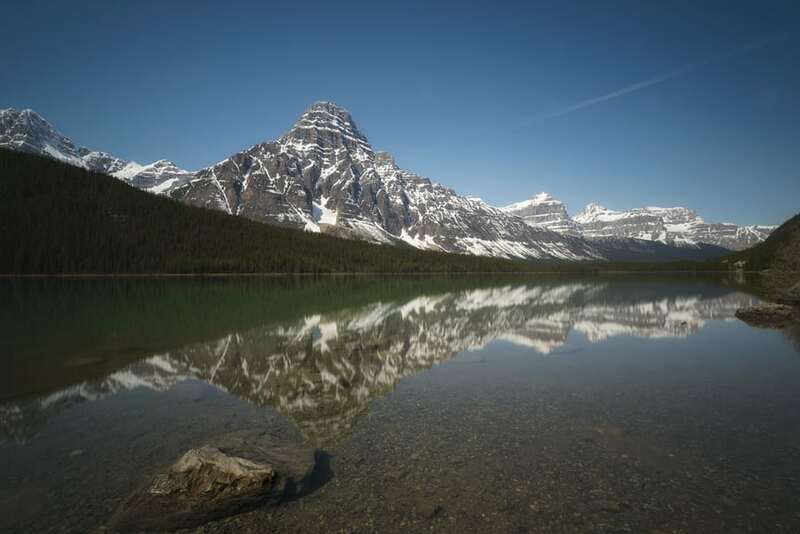 Our first photo shoot will be at sunrise on Two Jack Lake and Minnewanka Lake. We will take advantage of the daylight to explore the lakes and to hike some of the trails that border it, for example, the Stewart Canyon trail. 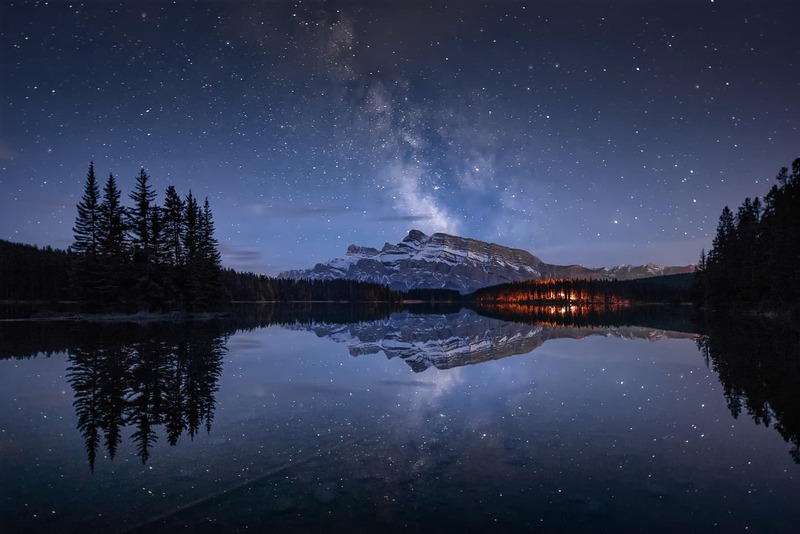 In the afternoon we will rest since this day we will also have a Milky Way night session at Two Jack Lake. The second day we will stay in the same place as the first night. 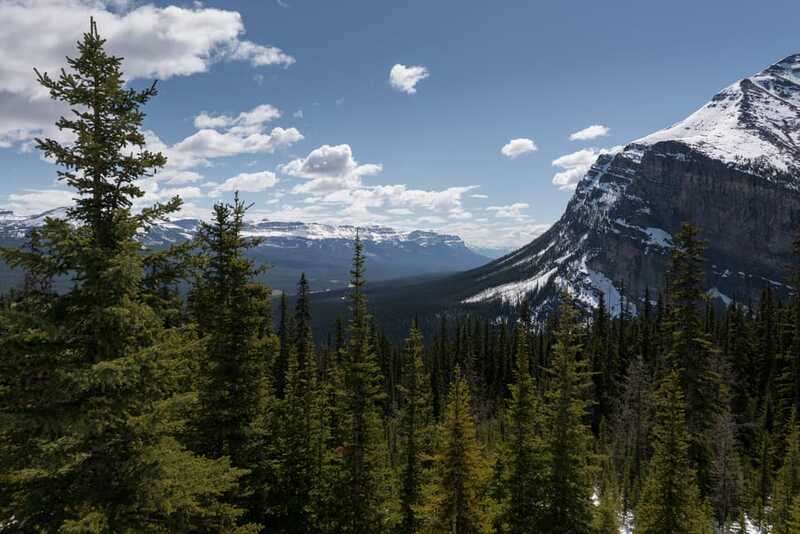 All the information regarding the planning of this day will be found in our Guide to Banff National Park. 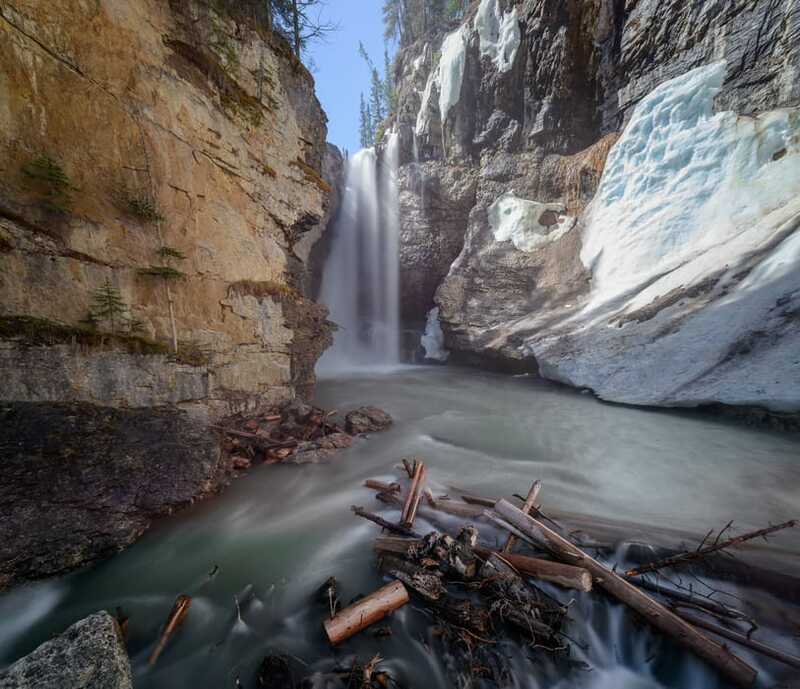 At midmorning, on the third day of our Canadian Rockies Photo Tour, we will hike the Johnston Canyon to photograph its two waterfalls. We will follow the path to the Ink Pots, to capture the vivid colors of the lagoons that are there. 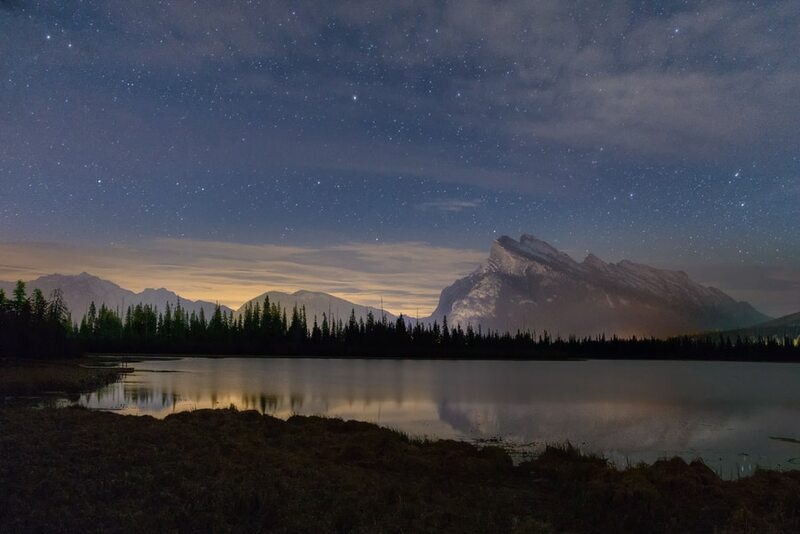 The rest of the afternoon we will rest in Banff and we will shoot the sunset at the Vermilion Lakes until we can capture stars. In principle, a long nocturnal photographic session is not contemplated, although it can be extended if the conditions are right. 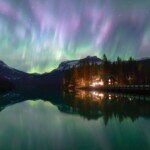 If there are Northern Lights, then we will go to Two Jack Lake. The third day we will stay in the same place as previous days. All the information regarding the planning of this day will be found in our Guide to Banff. 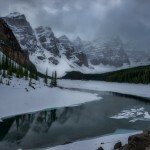 The fourth day of our Canadian Rockies photo trip will be less intense than the previous days. 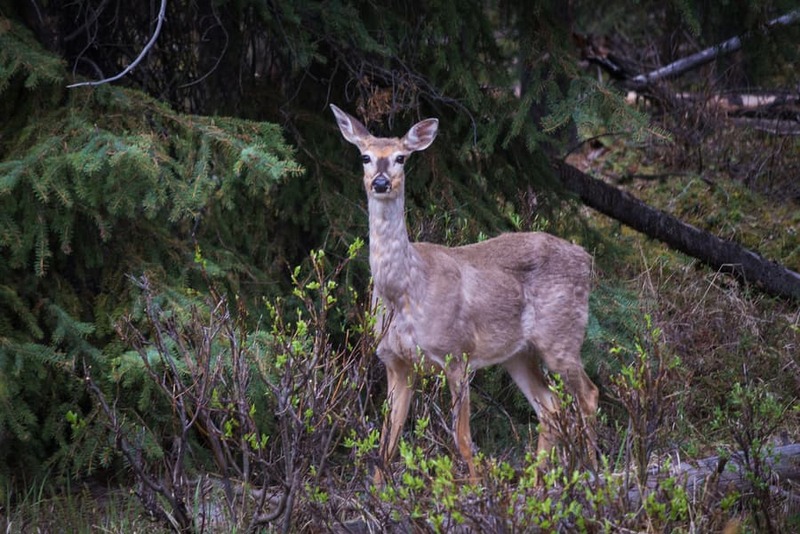 In principle, we will be touring the Bow Valley Parkway to be able to photograph wildlife. 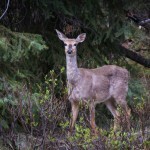 The Bow Valley Parkway is one of the best areas to photograph wildlife. 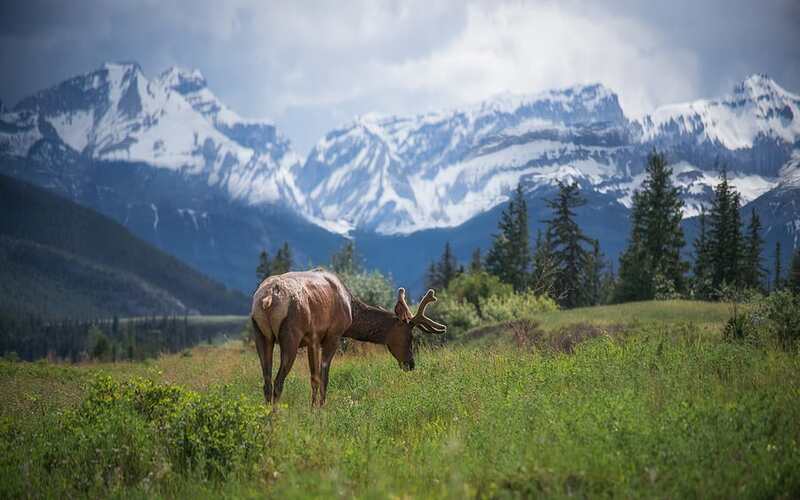 If you want to know the wildlife you can find, do not miss our guide to animals in the Canadian Rockies. 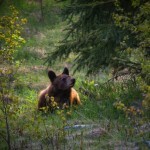 In addition to spot wildlife, we will make two very interesting stops. 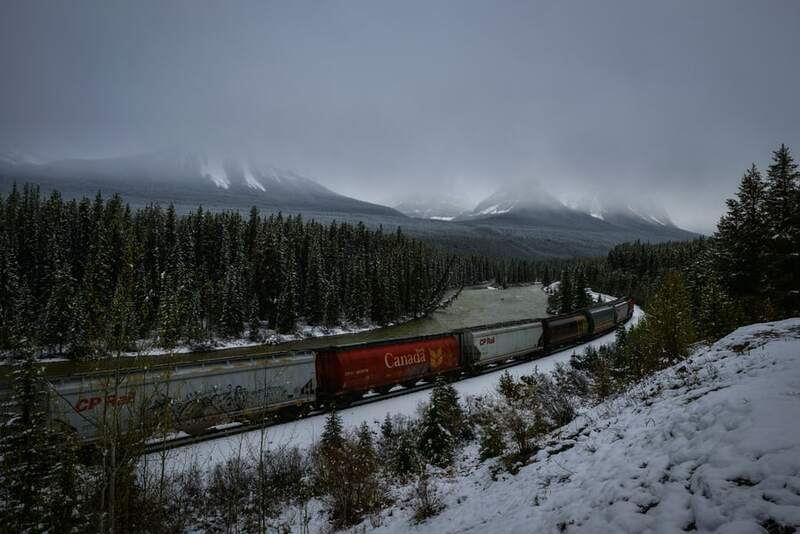 The first one in Morant’s Curve to see the section of the most photographed Canadian Pacific Railway. We will spend the sunset of the fourth day in Castle Mountain. We change accommodation. 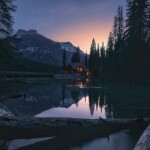 On the fourth day, we will spend the night in the surroundings of Lake Louise. 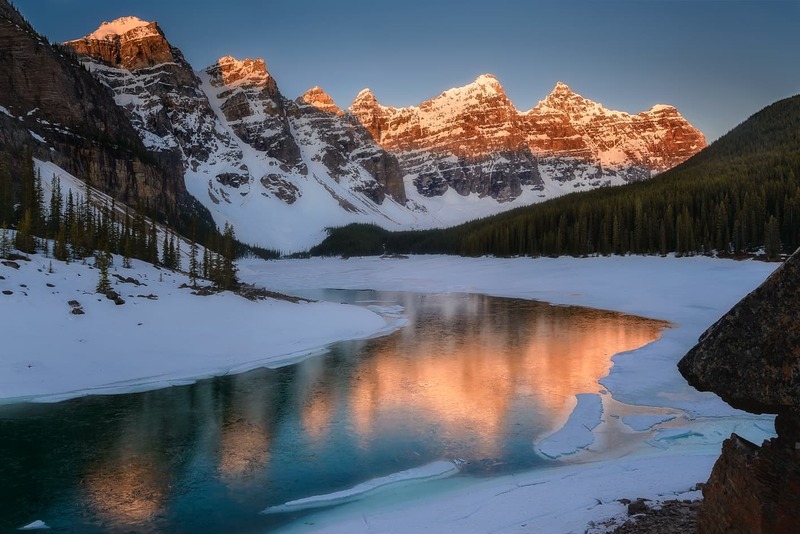 We will start the day early, as we are going to photograph Moraine Lake at sunrise. 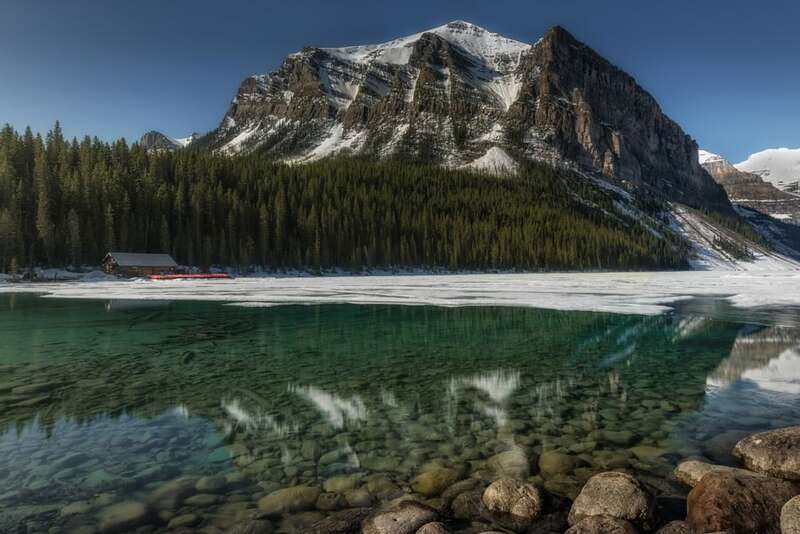 In the morning we will visit Lake Louise, to know what is possibly the most visited lake in the Canadian Rockies. From here it is possible to hike to Lake Agnes, where we will have views of the entire valley. 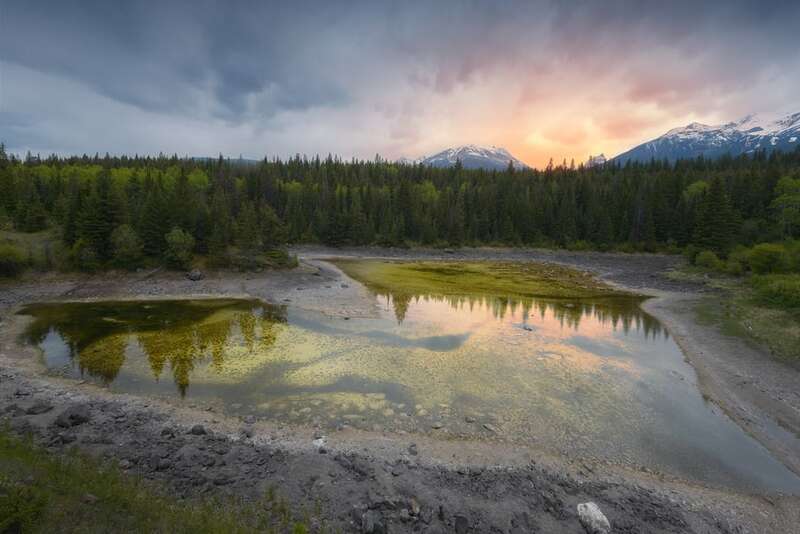 In the afternoon and at sunset we will be driving through both the Lake Louise area and the Bow Valley Parkway itself in search of more animals to photograph. We stayed in the same place as the night before. 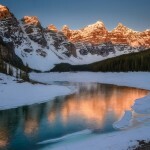 This morning we will repeat the sunrise at Moraine Lake. 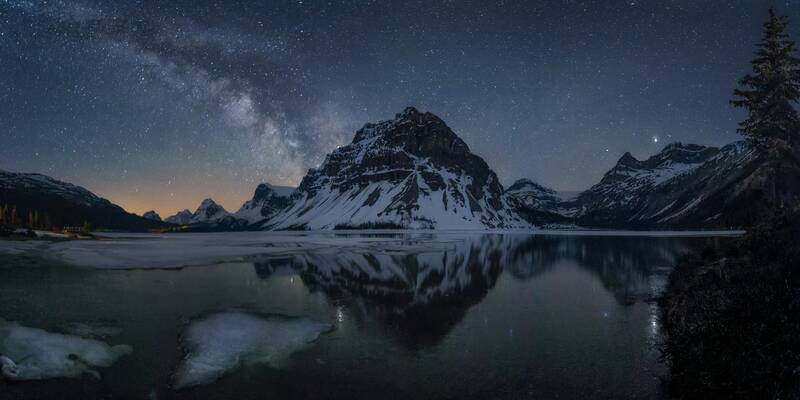 It is one of the most photographed lakes so we will try a second day if the conditions offer different lights. 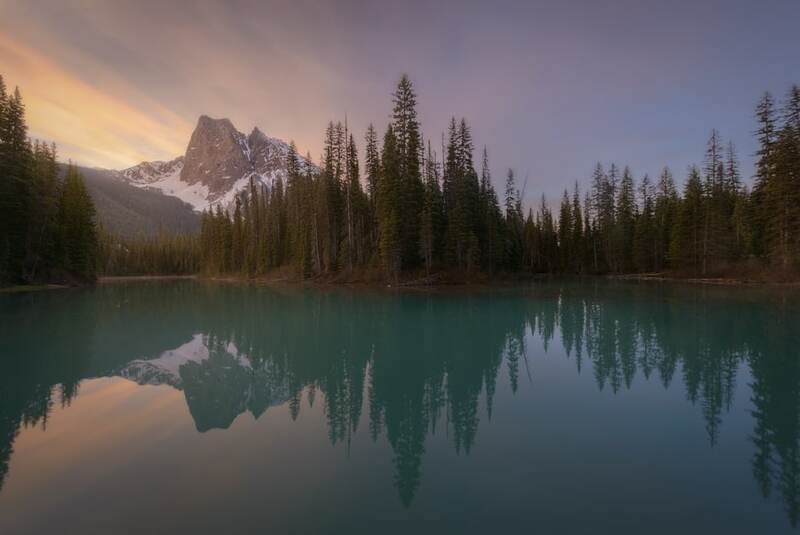 When the sunrise ends, we will go to Yoho National Park and its more popular lake, Emerald Lake. During the morning we will have an hour of canoe rental to take another perspective of the lake. 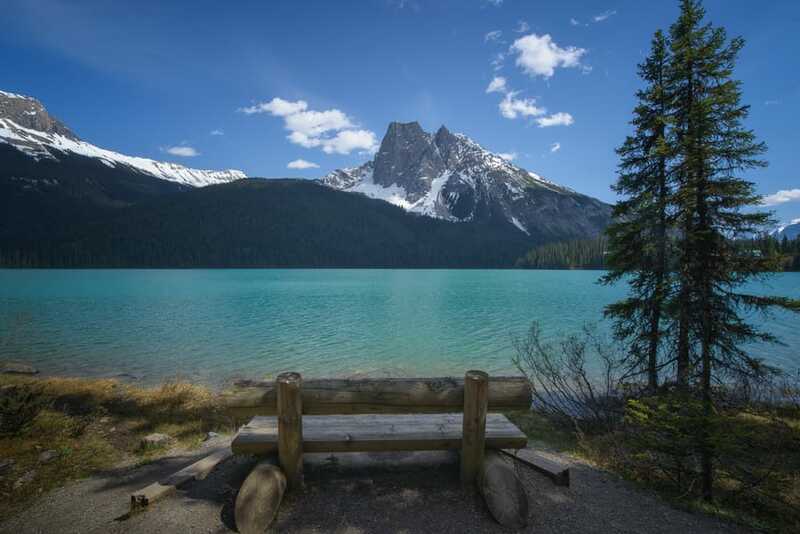 At mid-morning we will start a hike that will take us to Yoho Lake and from where we will have stunning views of Emerald Lake. 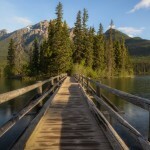 In the afternoon we will have to be back to the lake to be able to photograph the Blue Hour of the Emerald Lake. If with luck this night there is Northern Lights forecast we will do the photo shoot here. 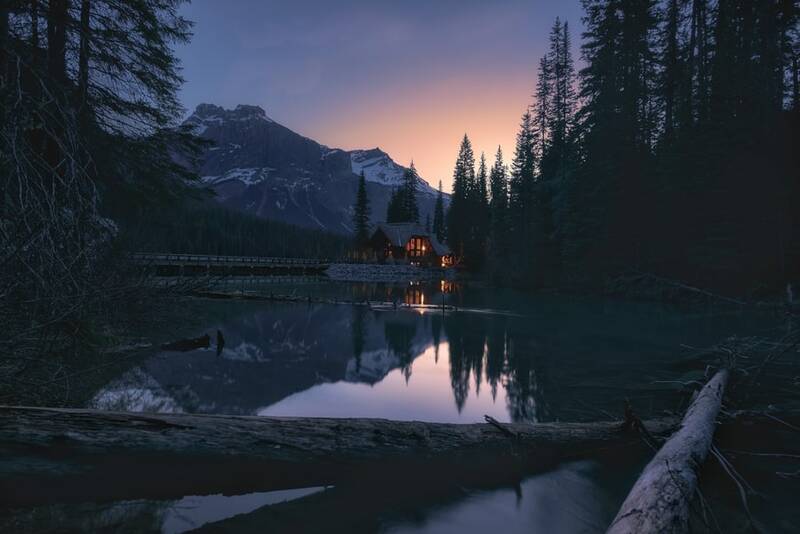 The sixth night we will stay at Emerald Lake Lodge, which has been serving us throughout the day as an element in the different compositions of the lake. 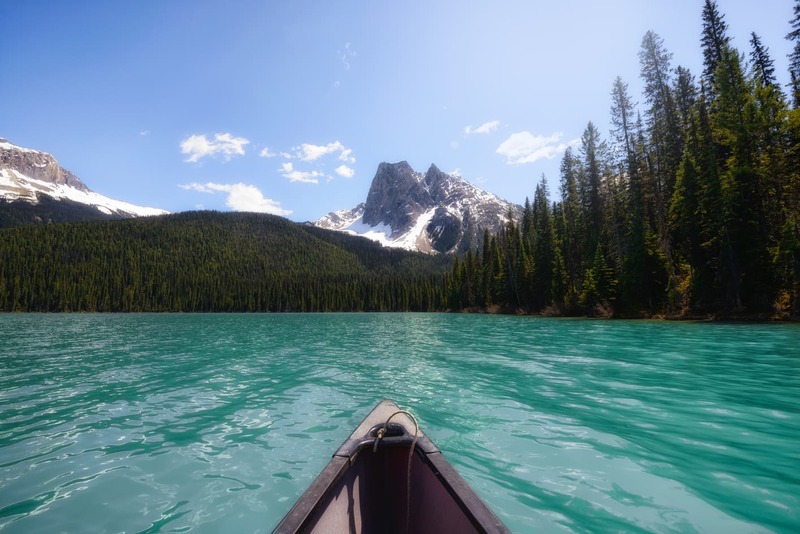 You can find all the information regarding the planning of this day in our Guide to Emerald Lake. 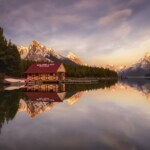 In the morning we will photograph Emerald Lake at dawn. 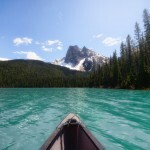 Then we will spend the day discovering other places in Yoho. 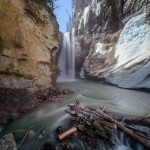 One of the most photogenic places is the Natural Bridge, where we can capture the blue water of the Kicking Horse River. 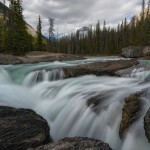 We can also photograph the Meeting of the Waters or the Takakkaw Falls. 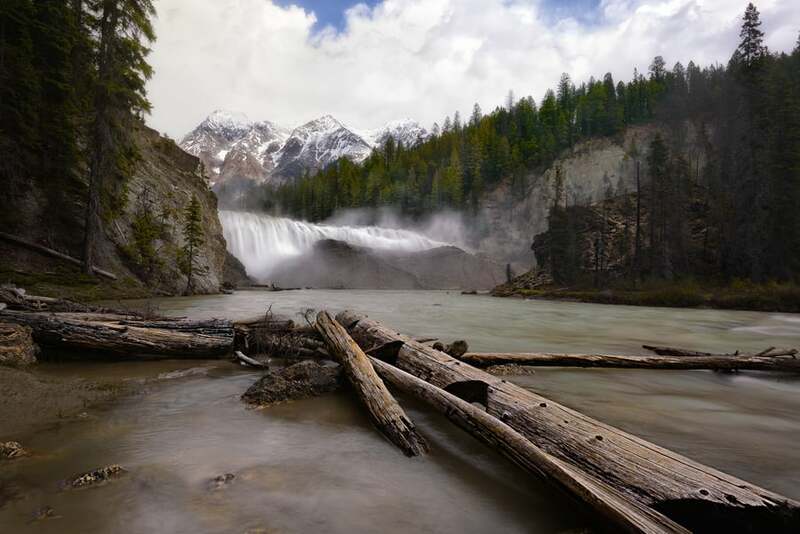 Finally, we will visit the Wapta Falls a little further away. The seventh night we will stay in the surroundings of Fields. 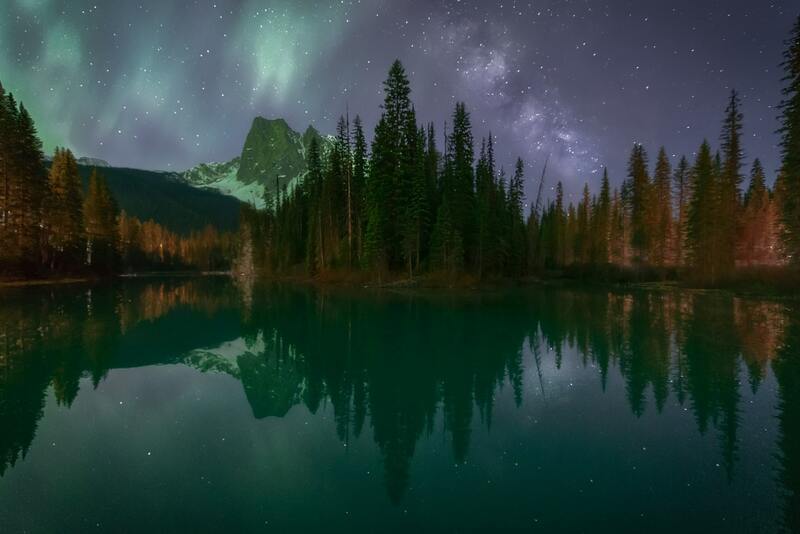 If there were Northern Lights forecast we would go back to Emerald Lake. 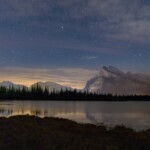 You can find all the information regarding the planning of this day in our Guide to Yoho National Park. If time permits and the road is open we will visit Lake O’Hara. You can only get to this lake by public bus that must be booked in advance. If, on the other hand, we can not access the lake this day, we will take advantage of it to make a photo editing and processing workshop. 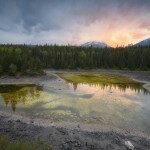 At mid-afternoon, we will go to the Icefields Parkway to do a sunset session at Bow Lake. 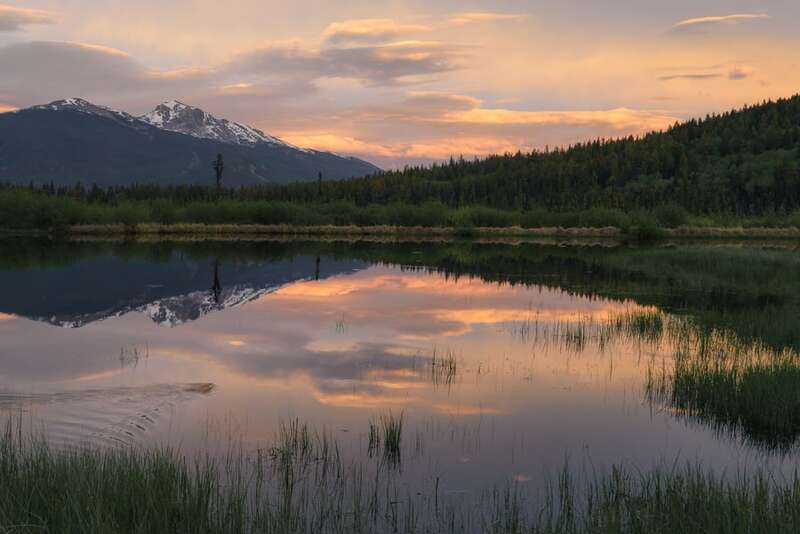 The best time to photograph this lake is in the golden hour of sunset. The perspective that we like the most is that of the right margin, next to the Num-Ti-Jah Lodge, where we will stay. In addition, we will make a night session in the lake, making coincide with the milky way. 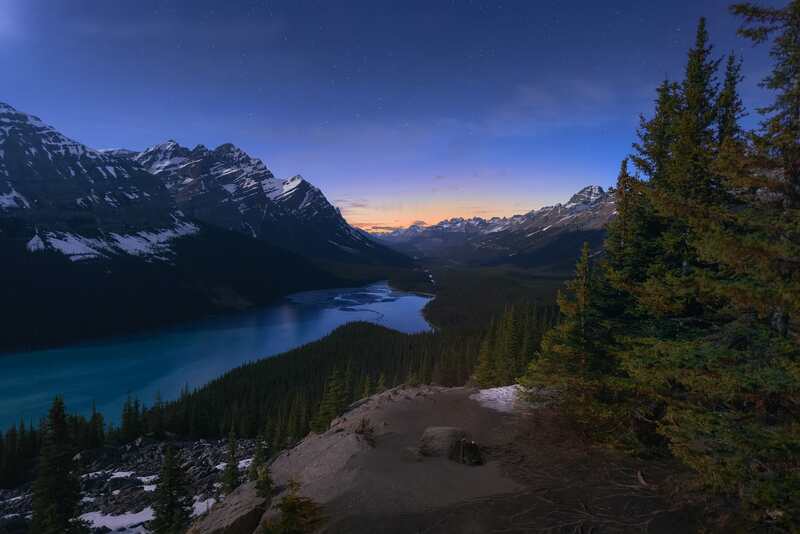 If there were aurora forecast we would go to Peyto Lake. 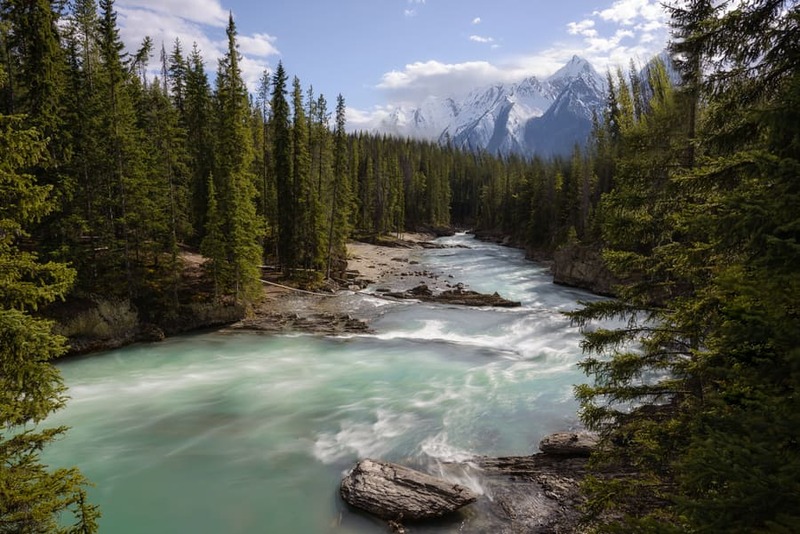 You will find all the information regarding the planning of this day in our Guide to Yoho National Park and in our Guide to the Icefields Parkway. 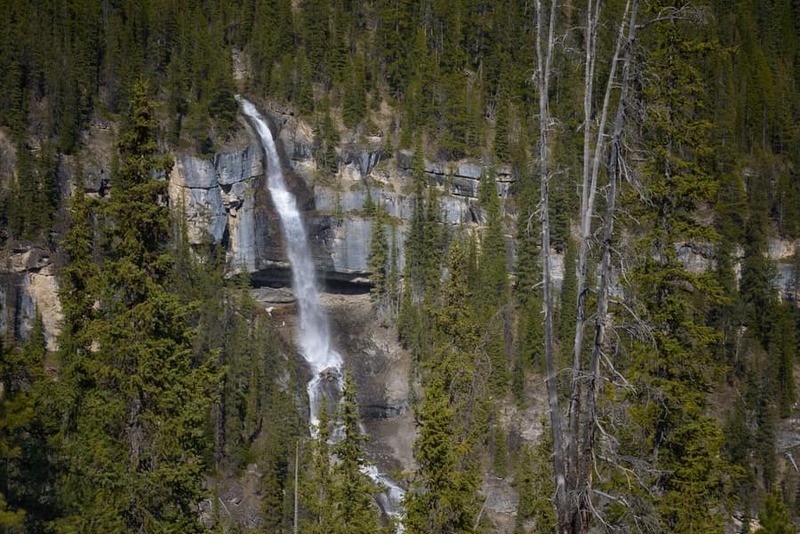 This day we will continue touring the Icefields Parkway, discovering places like the Mistaya Canyon. 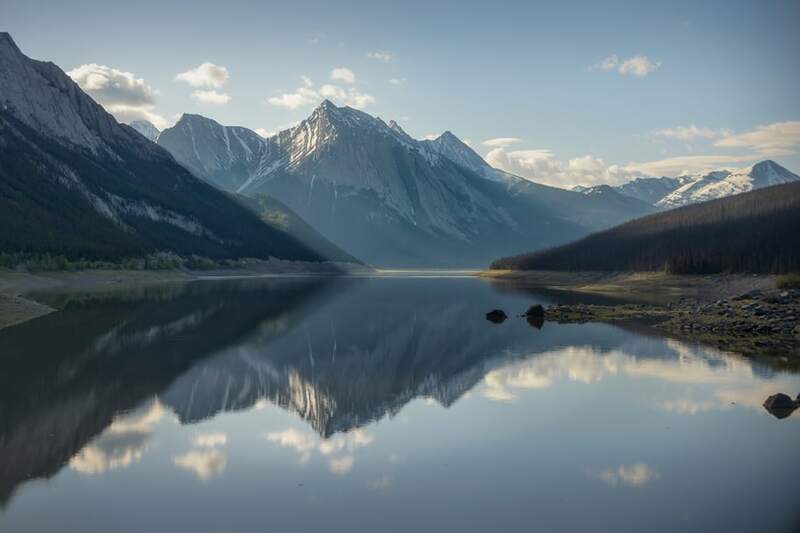 We will also visit other places of interest such as the Waterfowl Lakes and the Howse Peak. 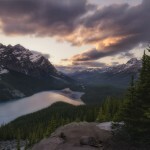 However, the most important photography session of this day is the sunset in Peyto Lake. We will take advantage, especially of the golden hour. The ninth night we will stay in the same place as the night before. 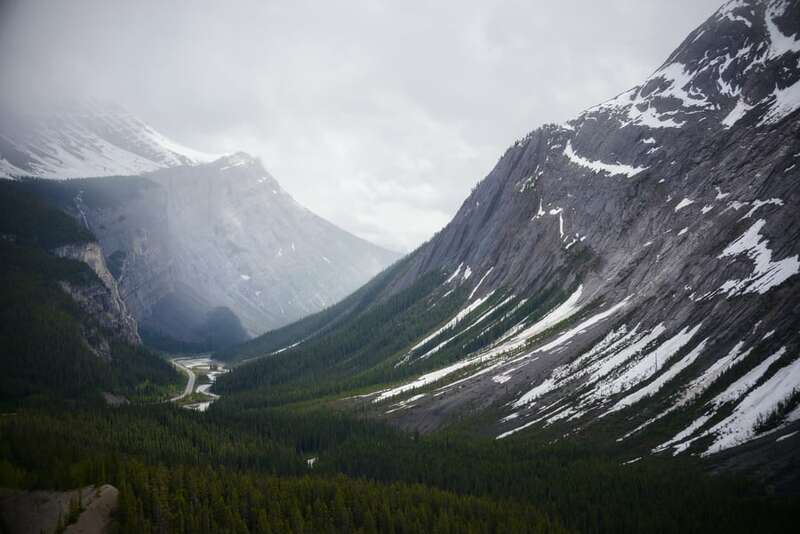 All the information regarding the planning of this day will be found in our Guide to the Icefields Parkway. 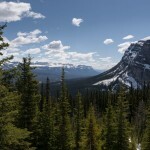 This day we are going to drive a large part of the Icefields Parkway. 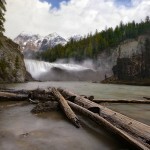 An interesting point to photograph is the Big Hill & Big Bend and the Bridal Veil Falls. We will continue this road passing through the Athabasca Glacier. Previously there was an ice cave that was an essential point for any Canadian Rockies photo tour. However, the cave collapsed and this stop is no longer so interesting. 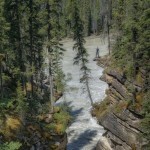 We will then arrive at the Sunwapta Falls, to make the first session of the day. 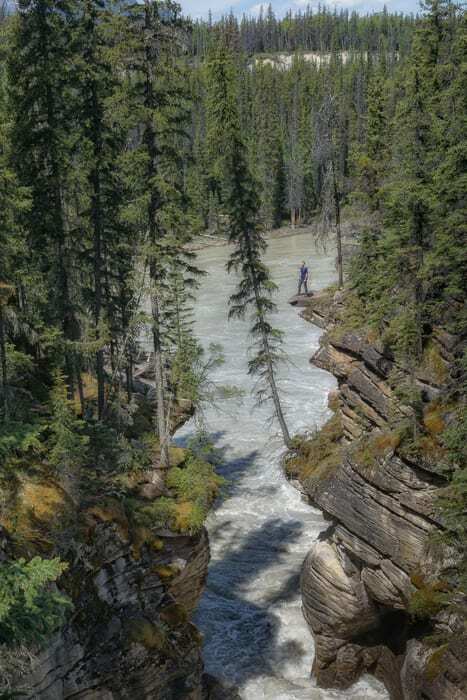 In addition, we will visit the Athabasca Falls. 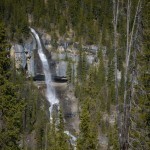 We will spend that night at Sunwapta Falls Rocky Mountain Lodge, for a night session at Sunwapta Falls. 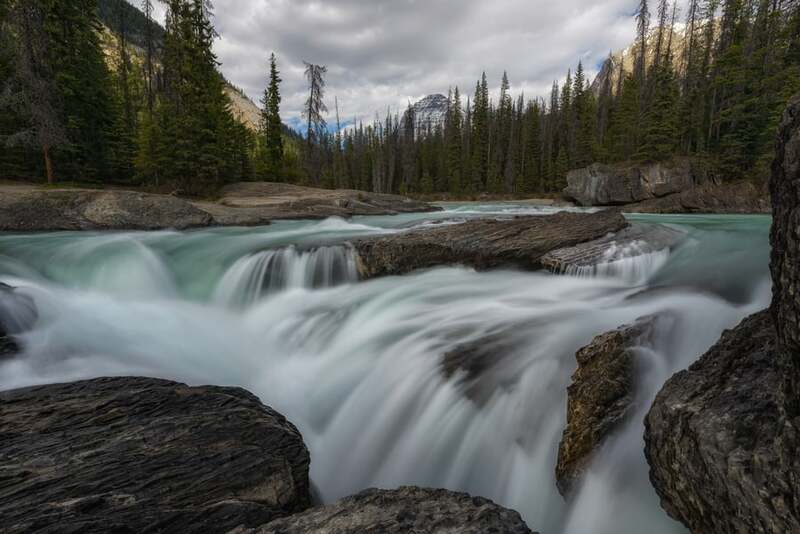 You can find all the information regarding the planning of this day in our Guide to the Icefields Parkway. 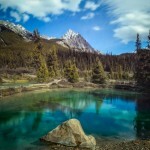 This day we will finish the Icefields Parkway to reach Jasper, the main town of Jasper National Park. 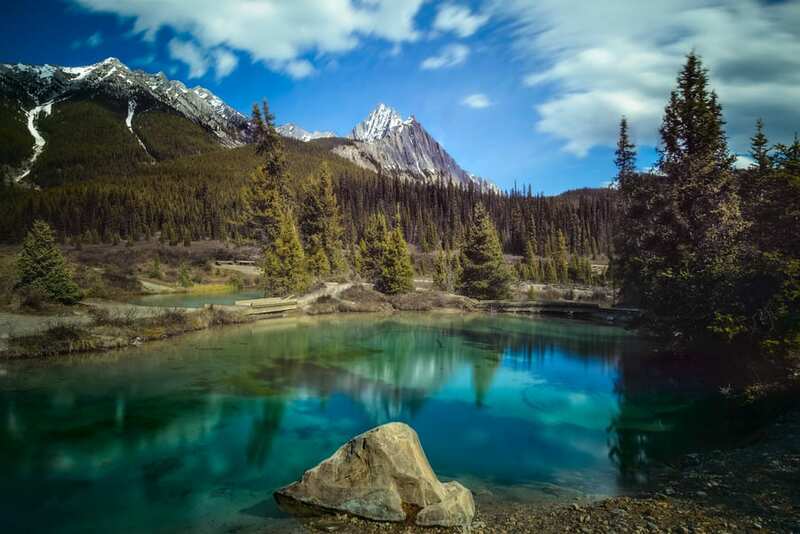 During the morning and when the sun is quite high, we will make a hike in the Valley of the Five Lakes, to capture the vivid colors of its lakes. 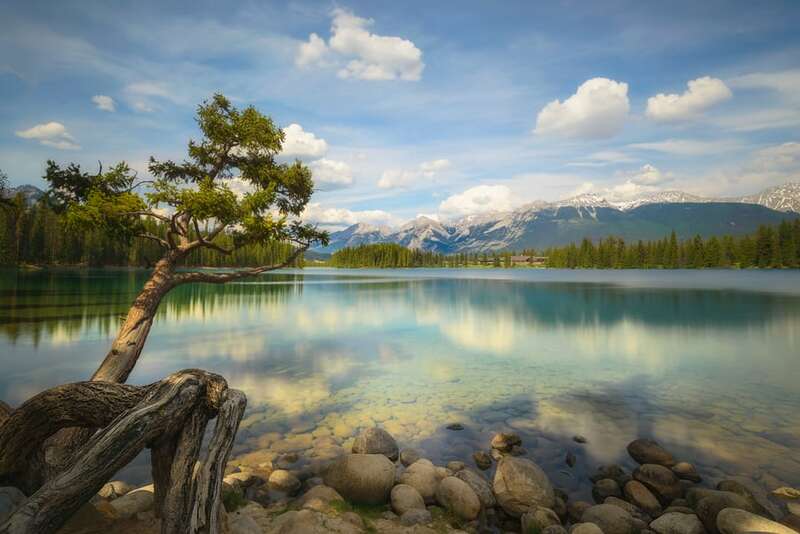 Then we will visit Patricia Lake, which is next to Jasper. 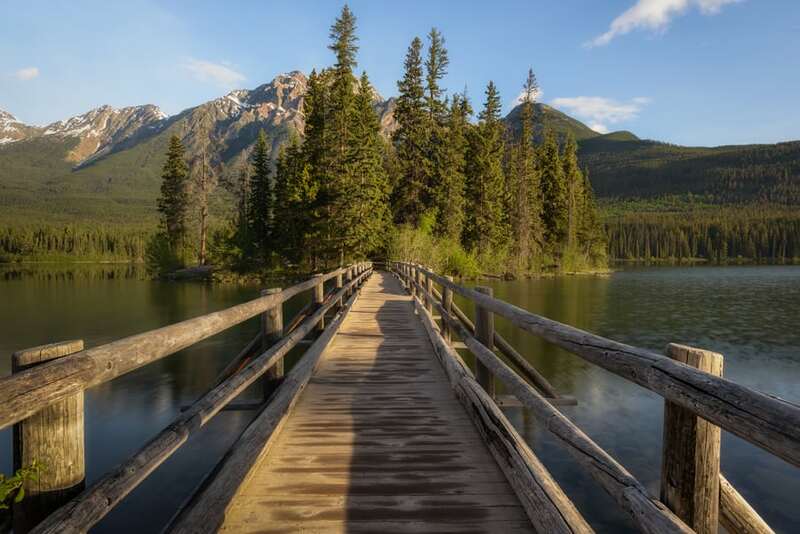 And we will visit Lake Pyramid Lake too, taking advantage of the composition that gives us the wooden bridge that leads to it small island. 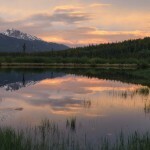 At dusk, we will go to Cottonwood Slough, where wildlife lovers can also photograph beavers. On the eleventh night, we will stay in the surroundings of Jasper. 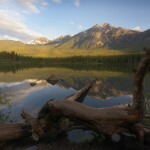 You will find all the information regarding the planning of this day in our Guide to Jasper National Park. The next morning we will get up early to do a photo shoot at dawn on Pyramid Lake. 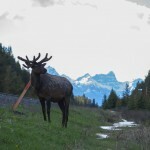 Then, we will tour Maligne Road, known for being the favorite road of wildlife photographers. You must have your equipment ready at all times. 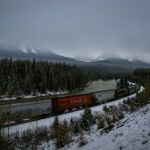 We will make the first stops at Maligne Canyon and Medicine Lake, known for disappearing at certain times of the year. 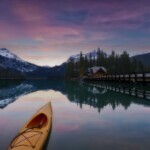 However, we will photograph Maligne Lake at dusk, taking advantage of the reflections of the water. This day we will stay in the same place as the night before. 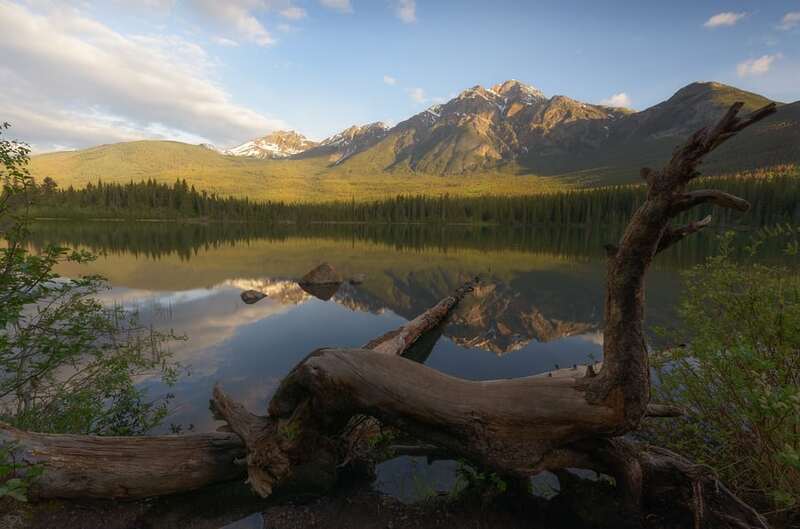 You can find all the information regarding the planning in our Guide to Jasper National Park. The next day our return will begin. In the morning we will visit some lakes that we have yet to see, such as Beauvert Lake, Edith Lake or Annete Lake. 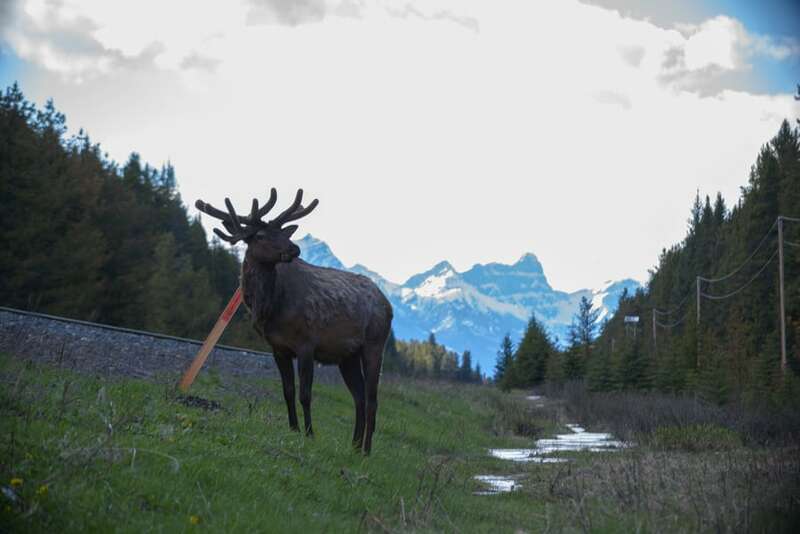 We will travel for the last time Maligne Road to spot, if possible, new wildlife. 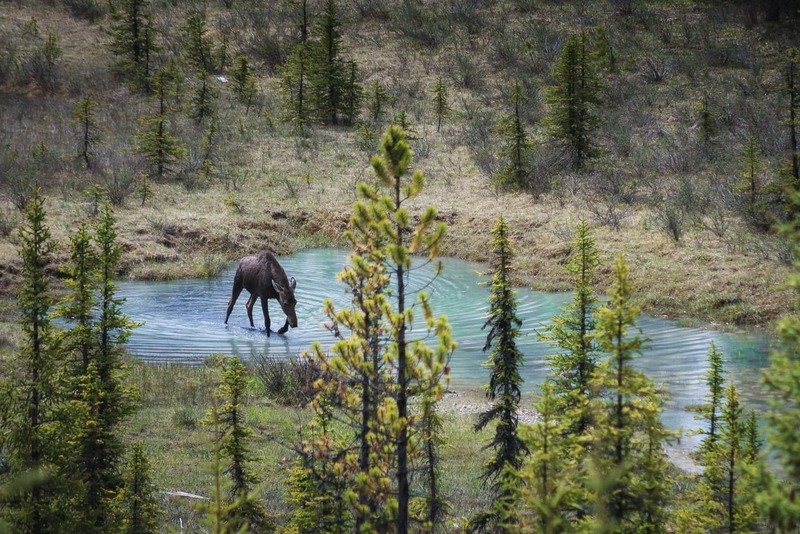 And we will take back the Icefields Parkway, very attentive to the animals we can find. On the thirteenth day, we will stay at the Icefields Parkway. As we will be returning at our pace we will not have reserved accommodation, but we will decide it on the fly. 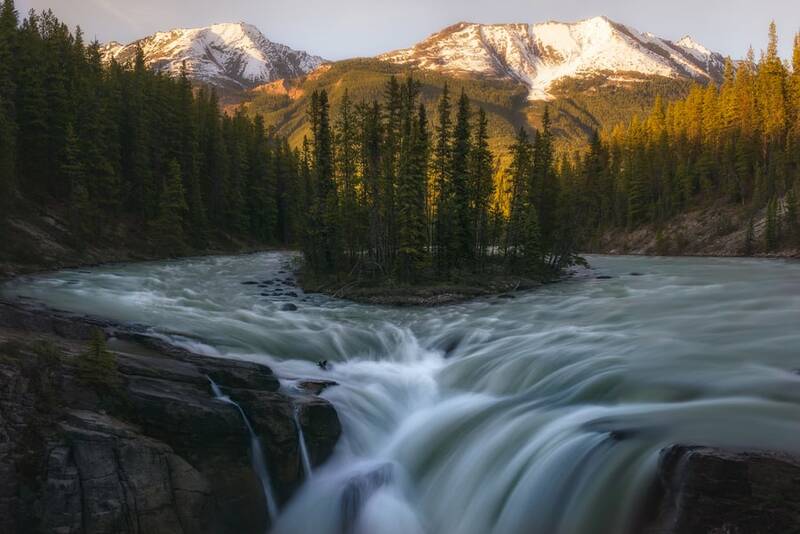 You can find all the information regarding the planning of this day in our Guide to Jasper National Park. Any photo tour itinerary is closely linked to the weather conditions. For that reason, we always like to reserve a free day either to repeat some of the photo shoots that we have not completed successfully or to make a new session that we could not perform before. The unforeseen arise, so it is better to take them into account from the beginning. 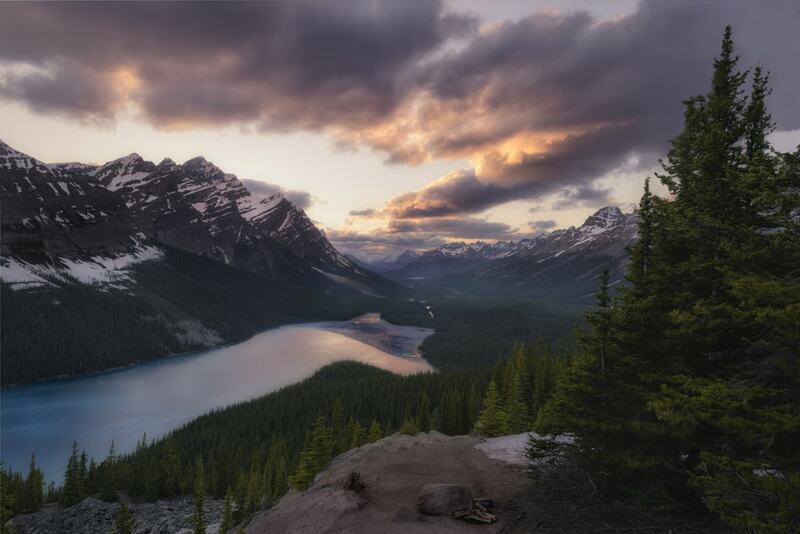 In the case of the Canadian Rockies photo tour we made in 2017, we decided to repeat the sunset of Peyto Lake. In the strange case that there was no need to repeat any photo shoot, we will take advantage of the day to do a photographic editing and processing workshop. 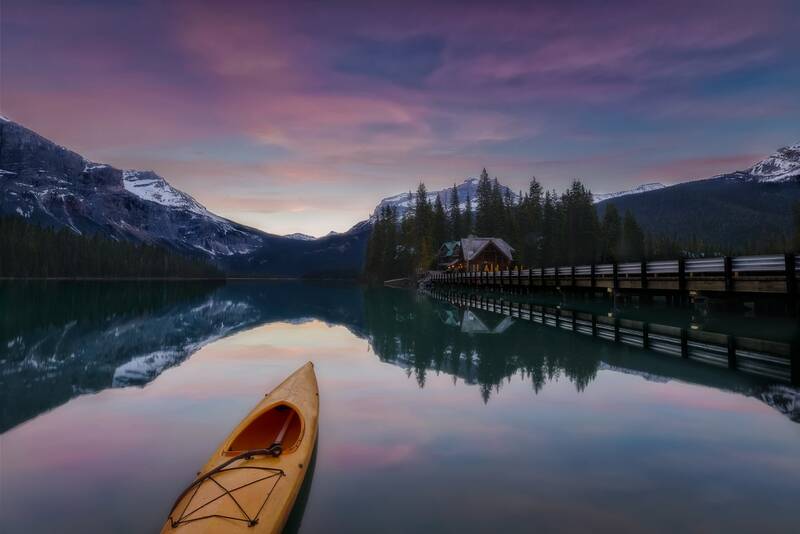 We should end this day either at Banff National Park or at Jasper National Park. Accommodation will be decided on site. 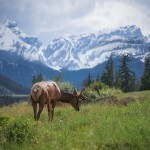 This day we will return to Calgary to end our Canadian Rockies photo tour. It has been a very intense photo trip so it is best to arrive at the airport with time and quietly review the photographs we have made through the camera screen. 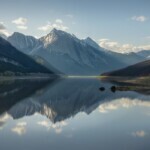 In this section, we tell you which are the places to take the best pictures of the Canadian Rocky Mountains. Maligne Watercolors - Jasper National Park. Canada. 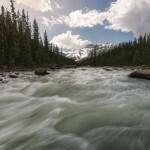 Horses flow - Yoho National Park. Canada. Two Jack, One Way - Banff National Park. Canada. 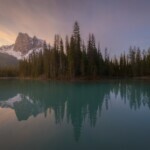 Emerald lake sunrise - Yoho National Park. Canada. Beauvert tree - Jasper National Park. Canada. 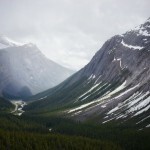 Peytozoom - Banff National Park. Canada. 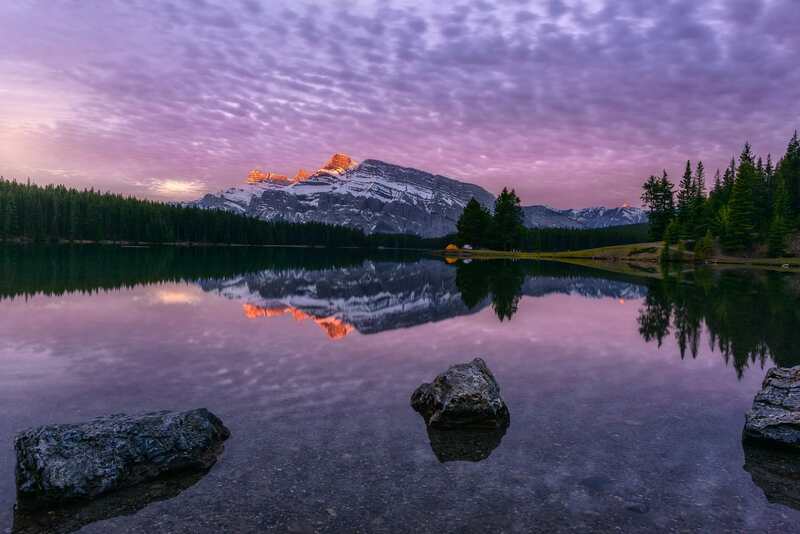 The 10 Fiery Peak - Banff National Park. Canada. Crystal heart - Jasper National Park. Canada. Two Jack Serendipity - Banff National Park. Canada. Sunwapta Painting - Jasper National Park. Canada. Download the Mapswithme app on your cell phone. Download and save the following KML file in your Dropbox. 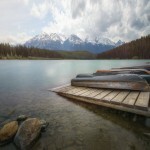 You can also enjoy all the pictures of the Canadian Rockies in this gallery that we have prepared. 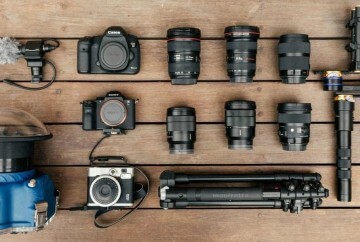 For those who have not read it, we already have an article where we recommend the best photography equipment for traveling. Although with a compact camera we can get good landscape pictures, I would not miss the opportunity to shoot with a DSLR or mirrorless camera with interchangeable lenses, since you can go back home with real masterpieces. In addition, if we pretend to photograph wildlife, twilight or hopefully aurora borealis, this type of camera is mandatory. We recommend a wide angle lens to capture the most amazing landscapes and a telephoto lens with a good stabilizer to photograph wildlife. As an optional, we can carry a 50mm lens for panoramic photographs, as well as any medium focal. A sturdy and stable tripod will be essential for our photo tour. If we can also choose a lightweight travel tripod it will be more comfortable to transport during hikes. You can also count on a leveling base / L-shaped plate to take panoramic pictures of the landscape. Whether we want to take photographs capturing the movement of water or for long exposures during the day when the light is very hard, we will need lens filters. 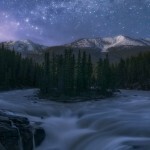 A neutral 3-stop filter and a 6-stop filter should be enough. We always use those of Lucroit, with which we collaborate, giving you a 10% discount when buying through this link. I also recommend that you read our guide to types and uses of lens filters in photography. 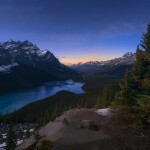 For us, the biggest mistake we made on our first photo tour to the Canadian Rockies was not having the right equipment. 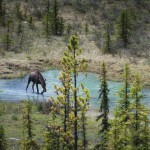 Specifically, a quality telephoto lens to capture the numerous wildlife of Canada. Really buying a telephoto lens, and in general, other elements of the photography equipment, is expensive, especially when wildlife photo tours are taken only a few times a year. In that case, I advise you to rent instead of going to the Rockies without the appropriate gear. 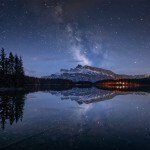 Is a Canadian Rockies Photo Tour needed? 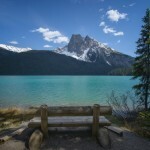 Perhaps you are wondering, is it worthwhile to hire a photo tour to the Canadian Rockies. 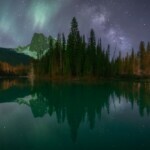 It is not necessary if you have experience in nature and landscape photography, you know all the animals you can see in the Canadian Rockies and where to find them, you know how to photograph the northern lights and you can plan the best photographic locations. 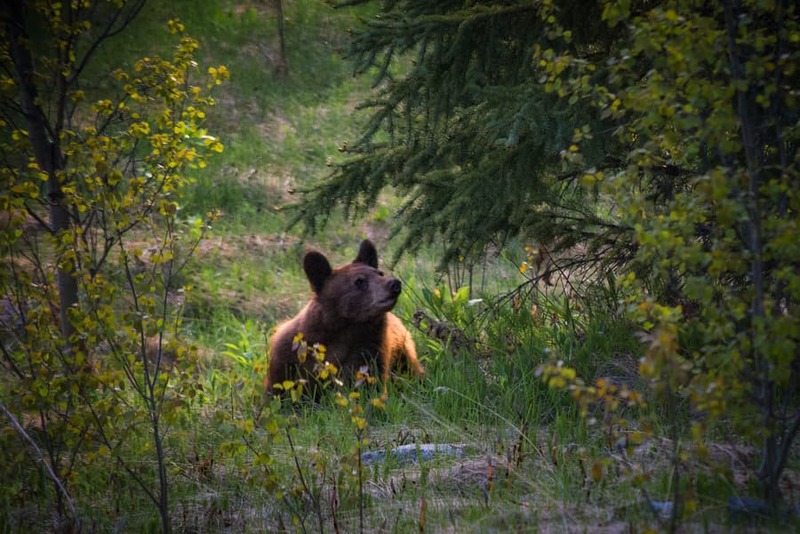 Even so, keep in mind that due to the presence of bears and other predators, in many of the hiking trails you are obliged to do them with more than 4 people. With a guided photo trip this problem would be solved. 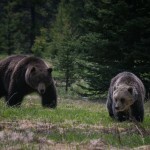 And of course, your guide will explain everything you have to do to avoid bear attacks. However, if there is something fascinating about taking a photo tour, it is to be able to share with other nature and photography lovers what is going to be possibly one of the most intense trips of your life. Do not do the tour with an agency but with a photographer or team of photographers in whose name you have access before hiring. If you really want the tour to add value, make sure your guide is a photographer with experience. Linking with the above, there are many unknown photographers with amazing galleries that offer these photo tours at very competitive prices. Never hire a photographer without first being able to check his gallery for that particular destination. 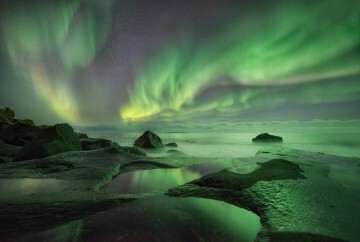 For this destination, it is very interesting that the guide also has some idea of wildlife, as well as having previously photographed Northern Lights (and of course that carries a Northern Lights alarm activated throughout the trip). Hire a tour that also includes editing workshops. 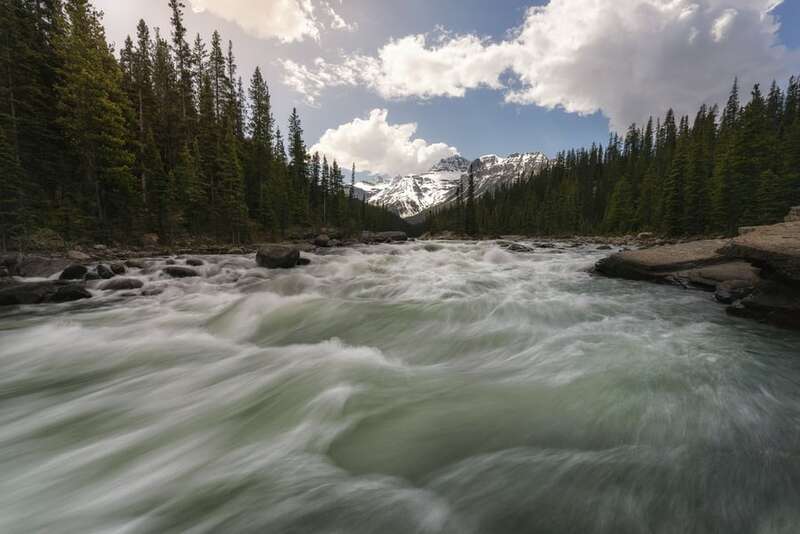 The weather in the Rockies is unpredictable and you can take advantage of it when weather conditions prevent you from doing outdoor activities. Finally, it would be very interesting if you could read some reviews from others photographers. 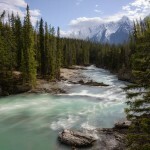 As for the price, perhaps now you want to know if there are cheap Canadian Rockies photo tours. This destination is quite expensive, also if you do it on your own. To be able to compare it, do you know how much we spend camping for 15 days in Canada and not eating in restaurants? However, it is an experience that deserves it and not only in the photographic plane. If you ask yourself what physical conditions are necessary for this photo tour, you should know that it is not considered a very demanding trip on a physical level. Most locations such as lakes, waterfalls, and canyons are close to the road. There are only three activities that require walking for more than an hour. These are the Ink Pots, Lake Agnes and Yoho Lake. In the case of not wanting to perform any of these activities one of the guides will prepare an alternative plan. As we have told you at the beginning of this article, in the future we would like to return to the Rockies with other travelers. We want to show you the wonders of this place and help you get the most out of it from a photographic point of view. This and other trips in Capture the Atlas are already underway. If you are interested, leave us your email and we will send you the information.